9x12, xxi + 99 pp. 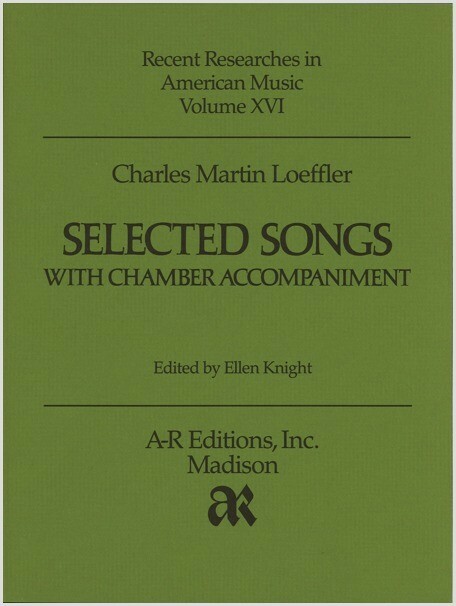 Charles Martin Loeffler's espousal of Symbolism in music made him an exception among American composers at the turn of the century. Unlike the majority of American works, which followed in the conservative German academic tradition, Loeffler's music mirrored the aesthetics of contemporary French poetry. In its own time this music seemed modern, ingeniously colorful, and strikingly original. Out of its own time it remains fresh and out of the ordinary. Loeffler's highly individual songs achieved considerable popularity during his lifetime, but the majority of these songs—as of his works in general—have never been previously published. The songs in the edition include settings by Baudelaire, Verlaine, Kahn, and Rollinat.